We will be adding new historic documents, so check back. Many documents are scanned and saved as pdf files, so they can be easily enlarged for better viewing. Click here to download the latest free Adobe Reader Software. 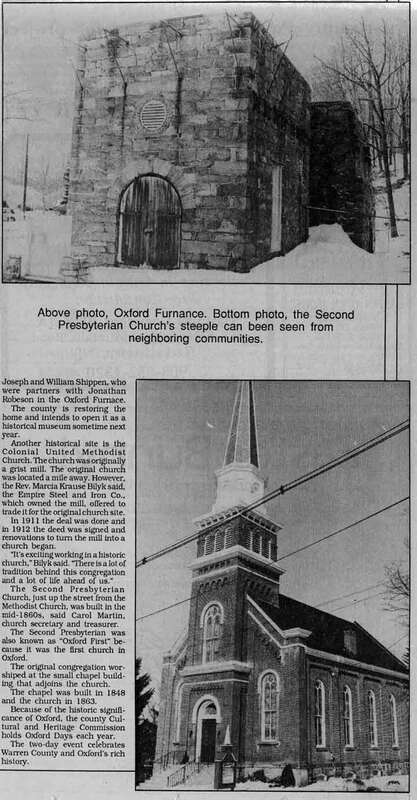 On Thursday, March 25, 1993, Oxford Township was featured in a full-page article in the Star-Gazette. One of the county's prime historical sites, the township had just been entered into both the New Jersey and National Registers of Historic Places. To see a larger image of the top of the article, click on the image above. 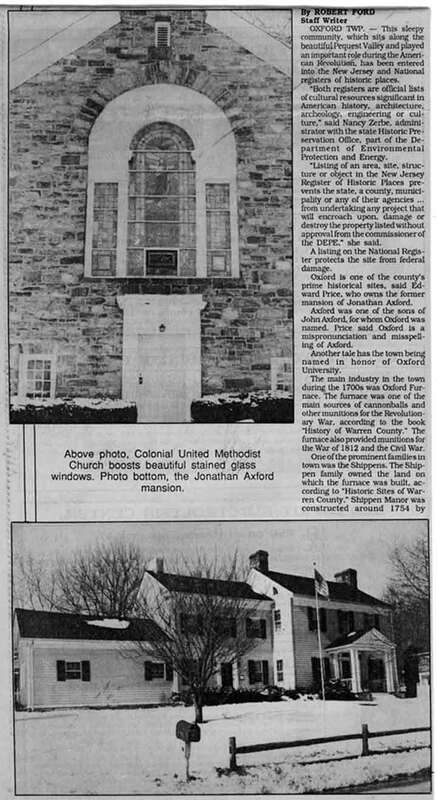 To read the beginning of the article and to see photos of the Colonial Methodist Church and the Jonathan Axford Mansion, click here. To read the rest of the article and photos of Oxford Second Church and Oxford Furnace, click here. In 1981, the Rev. Mark Curtis Carlson was called as pastor of Oxford Second Presbyterian Church, having just completed his M.Div at Princeton Seminary. This type-written document provides a brief biography, description of duties, and the terms of call. Read this article about his installation in 1981. The Rev. 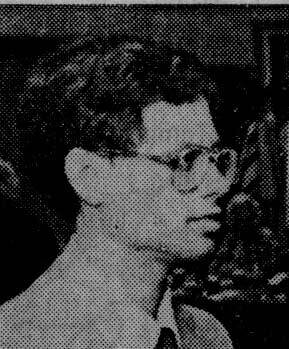 Dr. Robert Boehlke served as pastor from 1956 - 1959, before earning a doctorate from Princeton Theological Seminary. This was followed by many years of service in Jakarta, Indonesia and beyond. Read more in this summary of his amazing life story, "Beyond All Expectations." Oxford Second's 120th Anniversary was celebrated on May 22, 1983, while Rev. Mark Carlson was pastor. Click here to see the photo of Rev. Carlson and special guests, and to read the Express Times article. Click here to see the bulletin for the event. The September, 1978 issue of the "Ram's Horn," the church newsletter at the time, features an article about the celebration of members who had been active in the life of Oxford Second for 50, 60, and 70 years. Oxford Township Pastors in 1963 are listed listed on this sheet, as well as a partial list of pastors who previously served Oxford Second Presbyterian Church. The Oxford Second Church Budget for the year ending March 31, 1866, was submitted by then pastor, the Rev. E. Clark Cline in this handwritten document. Total budget, including expenses AND cost to build the chapel: $14,055.66! Do you have any old pictures taken at Oxford Second? Or stories about our church that you'd be willing to share? Much has happened over the years, and we hope to preserve and share our heritage. Contact us for more information.